The Call Center is tucked away in a quiet, second-floor corner of Monarch’s corporate headquarters on Pee Dee Avenue in Albemarle. The almost constant hum of compassionate voices can be heard reaching through their headsets connecting callers to Monarch services. During peak call in times, the nine-member team can sound like a bustling, crowded room. Last year the team fielded 252,000 calls and anticipates answering even more in 2019 with an increase in Monarch services across North Carolina. The Call Center, primarily a centralized scheduling department, can field over 1,200 calls per day. The bulk of calls are for the 17 behavioral health sites, which includes scheduling new patient visits and follow up appointments. The team also mans the live chat feature available through Monarch’s website. The Call Center’s customer service team consists of: Winnie Brown, Lisa Dunn, Christina Hallyburton, Natalie Makarow, Joyce McLaurin, Vickie Medlin, Teresa Mehaffey and Lucy Mosqueda. The Call Center department began five years ago with one customer service representative and a manager. Laganella, who was hired as the Call Center manager last October, is establishing a team focused on delivering exemplary customer service. “My team cares so much about the people we support, and they sit down in their chairs each day eager to assist them,” he said. Posted on a department bulletin board is a weekly report card fostering friendly competition among the customer service representatives. The weekly report outlines how they are doing individually and as a team as calls are tracked. Laganella also explained how a quality assurance process and an electronic knowledge base have been introduced to assist the team to better handle calls. 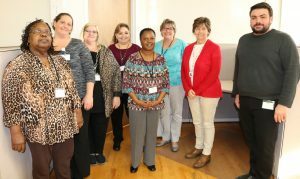 Call service representatives pictured from left to right: Winnie Brown; Christina Hallyburton; Lisa Dunn; Teresa Mehaffey; Joyce McLaurin; Lucy Mosqueda; Vickie Medlin; and Chris Laganella.